Mulch over first winter. Stake if plants show signs of flopping. Foliage is attractive all season. Beautiful and long lived. Large, graceful, beautiful. Under ideal conditions Meadow Rues can reach 3 to 4 feet. They prefer a soil that is moist and high in organic matter but are adaptable as long as they are not allowed to dry out. 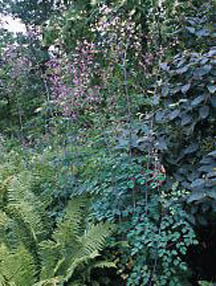 They tolerate partial shade and are useful in woodland edgings and semi-shade borders. T. aquilegifolium blooms late spring to early summer while T. delavayi blooms mid- to late summer. Both have panicles of lavender flowers and columbine-like foliage that remains attractive throughout the season. Both the flowers and foliage make lovely additions to garden bouquets. New plants should be spaced 18 to 30 inches apart. Division is rarely necessary and is somewhat difficult because of the deep, brittle roots. Winter mulching is recommended.